Or any combination of walking your Down Dog, Three-legged dog, Eiffel Tower posture, Wild Thing, or even Fire Hydrant Down Dog. You can also do a downward facing dog separated by postures of your choice. 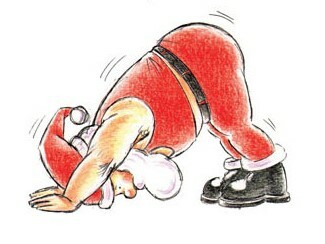 For example, Downward Facing Dog to Plank three times. To prevent wrist injury in the posture, make sure your middle fingers are parallel to each other and your hands are pressed equally onto the mat.